Elgin Street is currently undergoing construction from Gloucester Street to Isabella Street. This includes underground work on Waverley Street from Elgin Street to Metcalfe Street, through Jack Purcell Park. Access to the City Hall parking garage from Nepean Street will remain open. When exiting the City Hall parking garage onto Elgin Street, motorists will be able to turn right only. 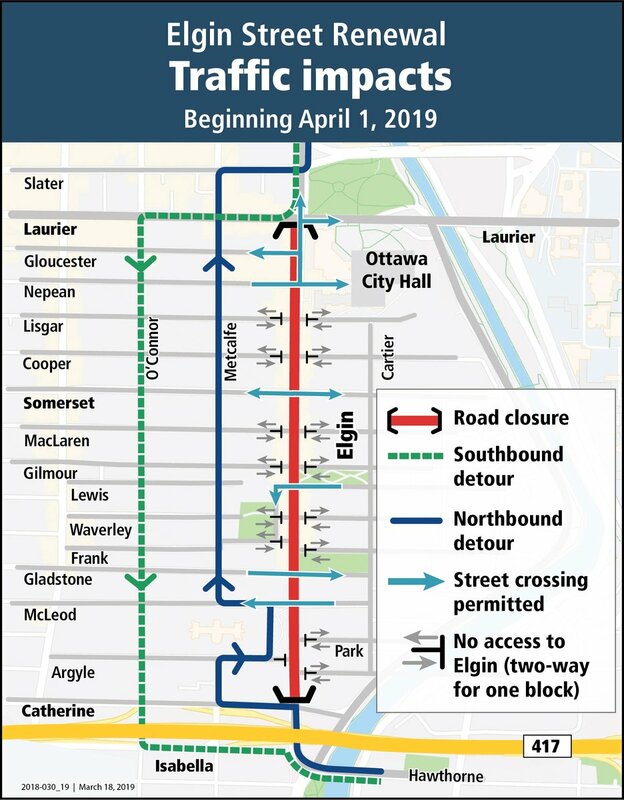 Motorists can then turn left from Elgin Street onto Gloucester Street to access the Metcalfe Street (northbound) and O’Connor Street (southbound) signed detours, or can travel north to Laurier Avenue and turn right to access the Queensway. Free parking is available at City Hall on weekday evenings after 6 pm and all day on weekends and statutory holidays. A traffic detour route has been established for northbound and southbound traffic. There are designated street crossings to provide east-west access to destinations next to the construction zone. 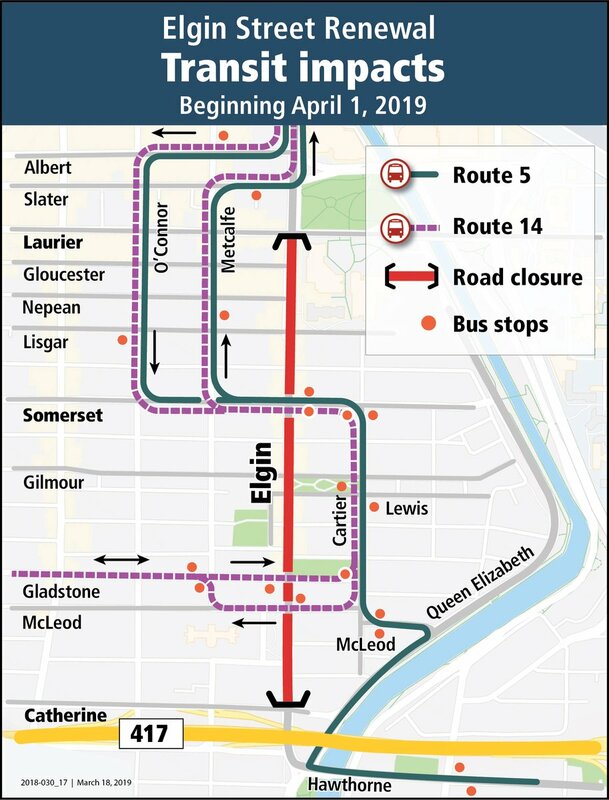 OC Transpo routes 5 and 14 currently using the southbound lane on Elgin Street from Laurier Avenue to Somerset Street will use the O’Connor Street detour route instead. Please visit ottawa.ca/elginstreet and OCTranspo.com for a bus detour map, route details and up-to-date information. Pedestrians can access businesses on both sides of Elgin Street at all times during construction. Various pedestrian crossings along Elgin Street are being maintained where feasible. Accessibility is important for the City of Ottawa. The City makes every effort to provide access through and around construction sites. If you require special accommodation, please contact the project team at elgin@ottawa.ca. There is a signed cyclist detour route. There are also many existing cycling facilities around the Elgin Street area. 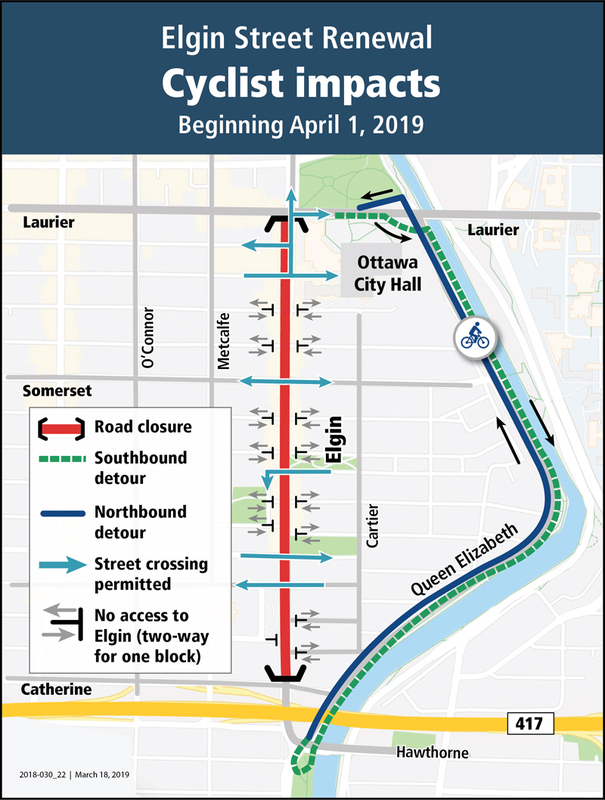 Please visit ottawa.ca/elginstreet for a cyclist detour map. For information about the project, including up-to-date traffic impacts, visit ottawa.ca/elginstreet. Sign up for the Elgin Street Renewal e-newsletter on ottawa.ca to get regular updates on the project. Email the Elgin Street Renewal project team at elgin@ottawa.ca. Listen to the traffic reports on local media.